CNN’s FAREED ZAKARIA GPS features an interview with Anote Tong, President of Kiribati. Tong speaks with Fareed about how climate change is critically effecting the island nation, and what role America plays in the debate. FAREED ZAKARIA, HOST, GPS: President Obama’s ambitious cap on carbon emissions sparked a lot of debate this week, but for another country, the climate change debate is more than words and policies, it is a matter, literally, of survival. 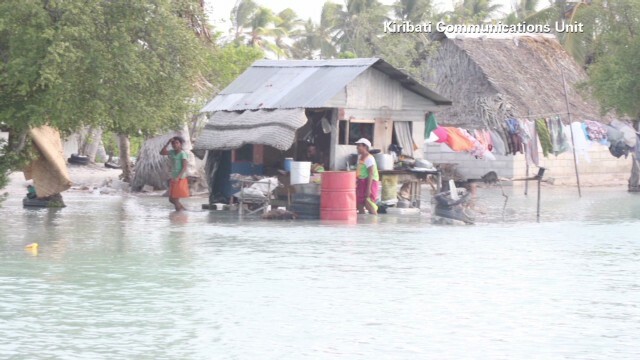 Kiribati, an island nation in the Pacific Ocean that 100,000 people call home, is the canary in the coal mine. It could be uninhabitable just 30 years from now thanks to rising sea level. Understand that this would be an entire nation wiped out by climate change. Here to talk about the problem and the plan to save his people is Kiribati’s president, Anote Tong. President Tong, a pleasure to have you on. ANOTE TONG, PRESIDENT OF KIRIBATI: thank you for having me and giving me this opportunity. ZAKARIA: Tell me about your country. Why is it particularly susceptible to climate change? TONG: Well, I think what’s important here to understand is the geography of atoll islands. Atolls are very small islands, barely two meters above sea level. And so, unlike most countries, if the sea level rises, we don’t have anywhere to move back toward, we don’t have any high ground to move toward. And so we’re so vulnerable. ZAKARIA: — you have 33 islands. And nowhere are you more than seven feet above sea level, correct? TONG: We have one single island, but it’s a — it’s a small island. But the rest are atoll islands. TONG: — with that sort of structure that I’ve explained to you. ZAKARIA: So you would — so 32 of the 33 would be underwater, in other words? TONG: They would all be underwater given the projections being put forward by the IPCC. ZAKARIA: And what does it look like right now? What are you beginning to already see? TONG: We have the severe inundation of the coastline in all of the different islands. Just earlier this year, the first three months, we had a — very high tides, unprecedented, which destroyed a lot of the coastline, destroyed a lot of property. And our neighboring island country, the Marshall Islands, they declared a state of emergency. We suffer the same problems. We are — we’ve had to sustain a lot of damage. We have to do a lot of repair work. ZAKARIA: And what does daily life look like, because you need drinking water, you need — you know, how do you– what are the effects already in though — in terms of those kinds of things? TONG: I think the disturbing thing that we see more frequently is the — it’s happening to more communities with the intrusion of the seawater into the water — fresh water lanes, into the fresh water ponds, destroying food crops. And so that is happening. ZAKARIA: How long do you think you have? TONG: Perhaps by 20 years time, we’ll see some really drastic, drastic impacts. ZAKARIA: So people might say, well, why don’t you just build some sea walls? TONG: We have been building sea walls over the years. That has not provided us with the answers and, um, the question is, what do you propose to do? Well, it’s been a — a very difficult question to answer. ZAKARIA: But you have two plans that I’ve read about. One is a Japanese company makes floating islands that you want to buy? ZAKARIA: The other alternative you’re looking at very seriously is to buy land in Fiji. TONG: Well, we have actually con — bought land in Fiji. TONG: It’s about 6,000 acres. And that is a lot of land, very good land. And the question you would ask me, which I probably would not answer you, is do you propose to relocate your people there? And my answer at this point in time is not immediately, but I think it’s a — it’s what we — it’s an investment. It’s going to provide food security. But let me make this point. Early this year, I — I had a visit, a state visit from the president of Fiji. And he was kind enough to speak on behalf of the Fijian people, to say that in the event that Kiribati does need to relocate their people, then Fiji would be willing and ready to accommodate them. ZAKARIA: What role does America play in all of this? TONG: Well, America, up to now, has been on the sidelines of the debate of climate change. I think the recent developments that I’m watching with a lot of interest, and now I’m sure the rest of the international community is doing the same, is the change in policy. And we see this as a very significant change, not only in the U.S. government’s position, but I think it will have — it will send a lot of very strong signals for the rest of the international community. ZAKARIA: What do you think will eventually convince the United States and China and India to get serious about climate change? TONG: Let me make the point that whatever is agreed within the United States today, with China, it will not have a bearing on our future, because already, it’s too late for us. And so we are that canary. But hopefully, that experience will send a very strong message that we might be on the front line today, but others will be on the front line next — and the next and the next. ZAKARIA: But you do think it’s too late for you? TONG: According to the science and the projections, I don’t think the science — the science is telling us it is already too late for us. And so we have been asking the global community to say, OK, think about the future, the speculation of what will happen. But don’t forget, those who are already affected, those for whom it is already too late, we are working together collectively with the countries in the like situation, Tuvalu, the Marshall Islands, the Maldives, where the impact of climate change is about total annihilation of our — of our nations. ZAKARIA: President Tong, a pleasure to have you on. TONG: Thank you for having me. ZAKARIA: Next on GPS, all people are created equal, right? Not so fast, according to my next guest. He has some controversial new science to share with us.